I was so excited when the letter arrived- I recognised it immediately and ripped it open at once… “YES! 3 years have flown past and I’m just so thrilled that it’s already time for another smear test!” Said no women in the history of woman-kind EVER! Like most women aged 25 to 64 (who are registered with a GP) I received my letter through the post with a “Helping you decide” leaflet which gave a bit more detail. To be honest, I wasn’t much of a fan of the leaflet as to me it read a little bit like- “Oooh, should I decide to buy a nice new pair of shoes or not” rather than “If you decide not to buy this pair of new shoes then you could miss the fact that you could be one of the 3000+ women each year who get cervical cancer…” Ok, I’m taking the metaphor a bit far, but you know what I mean. I’m not generally one to preach, but I make an exception when it comes to smear tests. You shouldn’t be “deciding” if you have one, the only decision to be made is which day of the week you book it in for. In 2009, reality star and mum of two Jade Goodie died just 7 months after receiving her diagnosis of cervical cancer. 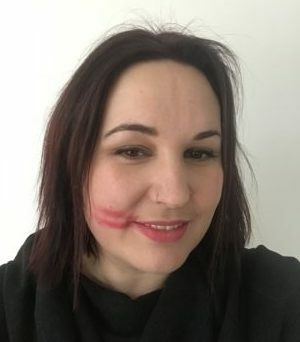 It is estimated that half a million women more than usual attended smear tests due to the “Jade Goody Effect” however the phenomenon seems to have been forgotten. Smear test numbers are at a 20 year low and we need to do something about it. 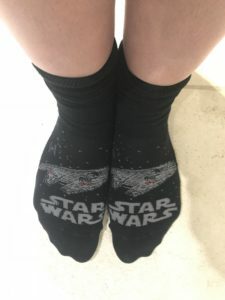 Despite my excellent leg-shaving efforts, I totally forgot about sock choice and am wearing some of my husbands turbo-geek “Star Wars” socks…. oops. 15 minutes after arriving I was back in the car, job done. I was vaguely aware of what felt like a very mild period pain for the next couple of hours but no paracetamol or anything was required.